Mindscape has become known as one of the most prolific of publishers for ST games, and now, in association with Sega of America, ST owners will be able to enjoy yet three more titles: Out Run, Space Harrier and Alien Syndrome. Out Run lets you get behind the wheel of a high-performance car for an exciting race through woods, European cities, beaches and the Swiss Alps at speeds of up to 200 mph. In its coin-op version, Out Run has sold over 18,000 arcade machines. 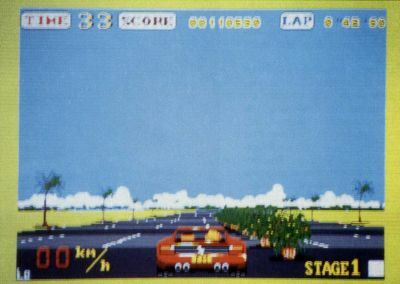 The European home-computer version has sold more than a quarter of a million copies. Out Run lists for $49.95. In Space Harrier, you are an astral exterminator who must destroy a gang of the ghastliest creatures in the galaxy. The mission is tough, but your laser blaster will provide you with a powerful weapon with which to battle the myriad of futuristic obstacles that you will encounter. Already more than 150,000 copies sold in Europe, the ST version is priced at $49.95. Alien Syndrome players must rescue some of their comrades who have become trapped inside a genetic laboratory run by a race of evil aliens. Players must destroy the evil mutants before the lab's self-destructing mechanism explodes—turning their comrades into a cloud of space dust. Sega has faithfully recreated the coin-op classic. Alien Syndrome lists for $49.95. Out Run lets you net behind the wheel of a high-performance car for an exciting race through woods, European cities, beaches and the Swiss Alps at speeds of up to 200 mph.